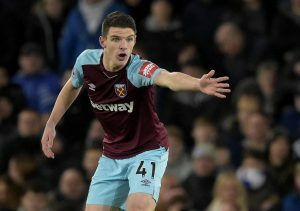 »News»Declan Rice saga takes fresh twist! Declan Rice saga takes fresh twist! Declan Rice’s international future has taken a fresh twist after Gareth Southgate said the young Hammer had a decision to make! The centre-back is in the middle of a tug-of-war between the Republic of Ireland and England, but has yet to commit to either. And Southgate, who is looking for fresh blood for his young England team, believes that only Rice can make the decision. He said: “He is a good young player… as far as I’m concerned he’s with Ireland at the moment. “There are so many dual nationality players, has a really difficult decision because there is a lot of pressure on him. “I’m conscious that he’s a very young man and there’s a lot of spotlight on him. As much as we think he’s a very good player, that decision has to lie with him. Rice has won three caps for Ireland, but they have all come in friendlies.